Lucy loves working in advertising and being in the city suits her. She grew up as a country girl and when her grandmother calls her and her cousins, asking them to come back home, she reluctantly agrees. Returning to the family farm brings back some difficult memories, but maybe being there will also heal Lucy and make her feel more fulfilled. The last person Lucy expects to meet is her old flame Garth. He's taken over the farm next door and is still single. He'd love to get reacquainted with Lucy, but she isn't there to stay, will this be a good idea? Garth loves living in a small town and being a farmer suits him. He's happy to be home and discovering that Lucy is there once more puts him in an even better mood. He knows she intends to go back to the city, but maybe he can find a way to make her stay. Their old sparks fly again straight after their first meeting, but will that be enough to convince Lucy to give Garth and countryside living a chance? Her Outback Cowboy is a sweet romantic story. Lucy is a cheerful girl. She loves bright dresses and I liked her fiery attitude. She fights for what she wants. She's lost a lot and this has made her a little bit extra cautious, but she also makes sure she lives and I admired that about her character. She and Garth are amazing together. They have a special connection on many different levels and I loved reading about their relationship. I couldn't wait to find out if Garth could convince Lucy to choose him and the family farm and this kept me glued to the pages. Annie Seaton writes about family in a wonderful heartwarming way. I could easily picture Lucy and her cousins. I loved reading about the farm and the animals and enjoyed finding out more about Lucy's history with Garth. Annie Seaton makes her outback setting come to life incredibly well and I could easily picture the beautiful land and its vastness and appeal. 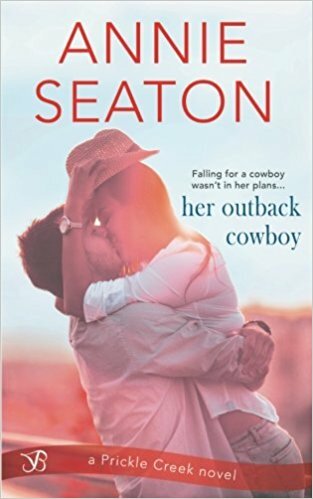 I absolutely loved Her Outback Cowboy, it's a fantastic entertaining, cute and charming story. Liam and Angie used to live together when they were both working in England. However, when Angie had to go back to Australia Liam decided his career was more important and didn't join her. He still regrets that decision. He's back in Australia now, running his grandparents' farm. Liam loves living in the country, but he doesn't intend to stay forever. He wants to return to the city to work as a journalist again. When Angie's back in his life he's desperate to have another chance, but is it fair to ask for one when he intends to leave once more? Angie is a small town vet. She enjoys living in the countryside and likes her new hometown very much. When Liam enters her practice she's stunned. She had no idea she ended up in the town he grew up in and finds it difficult that he's back to work on the family farm. Liam would love to spend time with Angie again, but he broke her heart once and she guards it carefully. Angie isn't convinced he's back to stay, so she feels she shouldn't get involved. Will Liam convince her to try, even though she's reluctant to let him be part of her life when he has the power to hurt her badly? 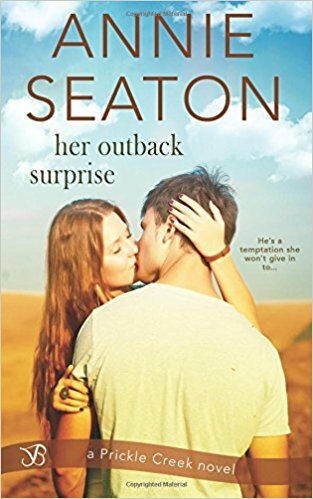 Her Outback Surprise is a wonderful story. Liam and Angie have a complicated history. They were both very much in love, but were never completely honest with each other about their feelings. They have the chance to spend some precious moments together again and this time Liam doesn't want to mess things up with Angie. He still has the same plans for his future though and the question if he'd be able to find out what's most important in life before it would be too late kept me on the edge of my seat. Annie Seaton writes about a fantastic family in a vivid and descriptive way that immediately warmed my heart. I loved reading about Liam and his time on the family farm. He's a born farmer, but being a journalist is something he's always dreamed of. Angie is perfect for him and their beautiful connection made their story a joy to read. There are plenty of sparks and their bond is deep and emotional. I love stories about soul mates and really liked this one. Annie Seaton has written another amazing Prickle Creek story that I highly recommend. Jemima is a famous model, but she doesn't particularly like the world of fashion. When her grandmother asks her to help out on the family farm Jemima is happy to move back to her hometown. She'd love to find a job as a teacher and has finished her training while working all over the world and earning plenty of money. It's time for Jemima to settle in the small town she loves so much and be accepted as one of the locals again, will she be able to make this dream come true? Ned has taken over his father's farm, which is quite rundown, so he has to start at the beginning. Ned is a single father and has to take care of his three kids while also running his business. He needs help and Jemima comes back into his life at the perfect time. Jemima offers Ned her expertise, she'll be a nanny for his children and this will give Ned the time to get his farm back in shape. However, someone at the bank thinks Jemima is Ned's fiancée and therefore they're willing to give him a loan he won't otherwise receive. There's only one option for him to make things work and that is marrying Jemima. They will both get what they want this way, but being in a fake marriage brings a lot of complications. One of them is that there's an agreement not to fall in love, will they be able to pull it off? 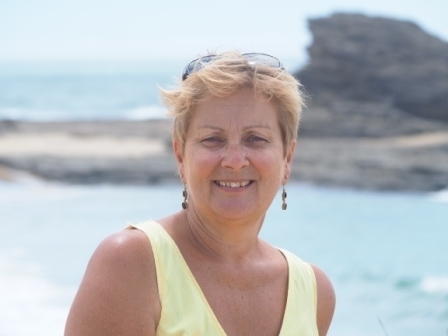 His Outback Nanny is a heartwarming romantic story. I was immediately intrigued by Ned's family. He has adorable children and tries to take care of them as well as he can, but he can't run a household and a farm by himself. Jemima loves being there for others, so spending time with Ned and his kids is exactly what she's always dreamed of. However, they aren't her actual family and this proves to be difficult. Especially when sparks are constantly flying between her and Ned. I read their story in one sitting and finding out if they'd find their happily ever after kept me glued to the pages. Annie Seaton has written a wonderful love story. I love small town romance and His Outback Nanny is definitely a good one. There's so much chemistry between Ned and Jemima, but their relationship is supposed to be strictly business, which makes incredibly entertaining reading. Annie Seaton combines this with a gorgeous setting, which mesmerized me straight away. 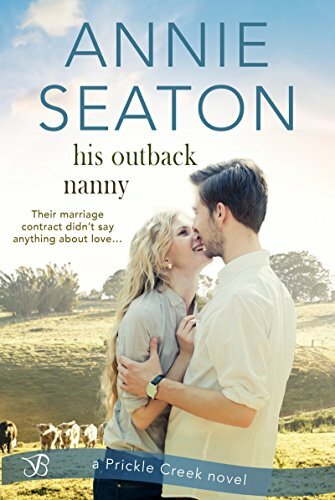 I absolutely loved Her Outback Nanny, it's an amazing story about true love, attraction and family. If you love small town romance you don't want to miss the Prickle Creek series. The stories can be read as standalones, but if you want to know every single detail I'd advise you to read them in their correct order. I am truly blessed to live by the beach on the east coast of Australia. I am following my lifelong dream of writing and discovering that readers love reading my stories as much as I love writing them is awesome. It's what keeps me at my desk each day when the garden and the beach are calling to me! You can read of the topical human and social issues I explore in Kakadu Sunset, Daintree and Diamond Sky. My upcoming book with Harlequin Mira, WHITSUNDAY DAWN (August 2018) is a historical/contemporary story set in the Whitsunday islands in 1943 and 2017. My inspiration comes from the natural beauty of our Australian landscapes and I'm passionate about raising awareness of the need to preserve the pristine areas that surround us. I'm also published internationally in e-books in the romance genre, and in 2015 and 2017 was voted Best Established Australian Author by romance readers in the AusRom Today Readers' Choice Awards. In 2016 Kakadu Sunset was shortlisted for the Ruby Award in the category of best long romance. Each winter, my husband and I leave the beach to roam the remote areas of Australia for story ideas and research. My love of books, reading and writing, began even before I started school and I discovered libraries! 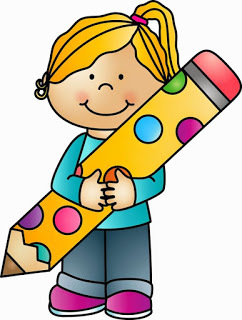 My skills were developed in "composition" classes during primary school and continued throughout the completion of an English and History degree. I am delighted that my books are now available in book stores AND on library shelves! 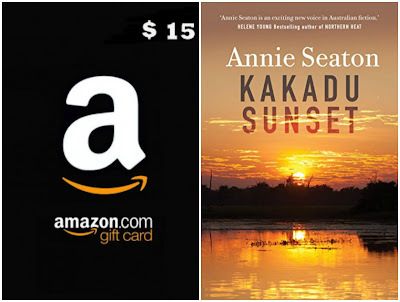 One very lucky reader of With Love for Books will receive a $15 Amazon gift card and a digital copy of Kakadu Sunset by Annie Seaton. Two runner ups will receive a digital copy of Kakadu Sunset. The Prickle Creek series sounds like sweet stories of romance and second chances with engaging characters and spirited beliefs. Thanks for the introduction to this author. All of her books sound like stories I will enjoy. Thank you so much for having me visit... I am so pleased you loved Prickle Creek... Sebastian's story is out in May! I am looking forward to your next book in the Pickle creek series. So pleased to hear that., Jo! These look like lovely books, good luck with them. 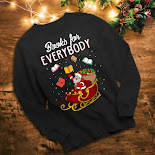 I appreciate the book description and the great giveaway as well. Really like the cover as well. One I know I would be checking out for my sister to read. Such a gorgeous cover photo, I love it! I so enjoyed your http://wherethefekarwee.blogspot.ie posts, especially the sunrise/sunset piccies! What a beautiful cover! Can't wait to read this! This looks like a good read! Thanks for sharing. I've been to Sydney twice and loved Australia, these novels would no doubt take me back and I'd be able to explore more of Australia with them. I'm new to this author and think these stories all sound like excellent reads. Love the sound of here books! Thanks for the giveaway! I can get lost in that cover photo. thanks for the review, this looks like a great read! This looks like a great read that I would really enjoy! Sounds like a story I will enjoy reading. Great review. 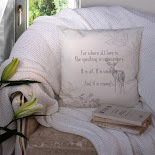 I love a sweet romantic read! I used to love composition classes too! Such a shame they don't exist on the curriculum any more. 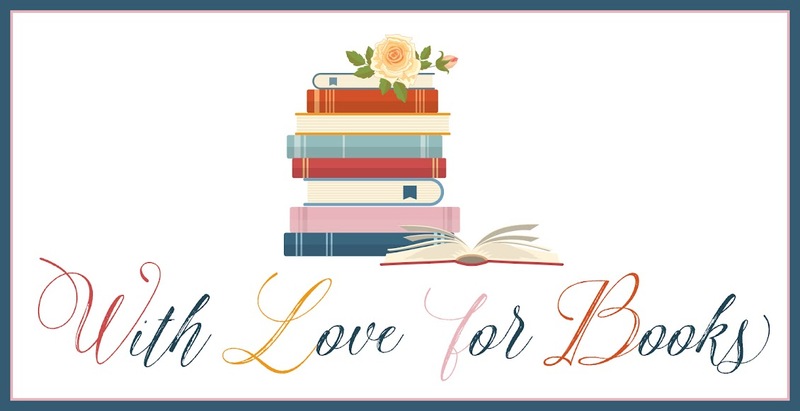 I love books set in Australia - I lived there for a year & fell in love with it! Love a good romance and this one sounds great. Not read a lot of Australian-set novels (even though my favourite actor is Australian) but love the idea of the "returning to your roots" scenario and the change from suits to stetsons (do they wear them on farms in Australia lol)? This sounds like a heartwarming romance. Love the Australian setting! I would like to give thanks for all your really great writings, including Her Outback Cowboy, Her Outback Suprise & His Outback Nanny. I wish the best in keeping up the good work in the future.